I did something today, that for me was quite decadent......a friend had given me a certificate for a facial at a local spa.......and yes I had a facial today, the first one in years. I may not look ten years younger, but I feel it! It was sooooo wonderful to just lie back and let someone take care of me for an hour. It was so relaxing, at one point I think I fell asleep! Rick and I met a friend for lunch today......she is a new friend, but one that we have loads in common with. She is in the arts and music industry, just an amazing woman. We are looking forward to working on some projects with her. Tonight, we went to a songwriter in the round show at an art gallery in Birmingham. A couple of our friends performed, we heard some great music and Rick and I will be performing there on July 14th. It has been a very good day, one that I have needed for sometime. I know that I have the caregiver's personality and that I spend most of my time caring for others. I forget my "airplane" rule sometimes (you know the one that if the masks drop,put yours on first and then help others) but today reminded me of how important it is to do something for yourself. I never realized how "spent" I was, until I lay back in that chair and felt tension leave my body. I think there are alot of us who "spend" most of our energy doing/caring for others and we have no clue about our needs. Once again, I have to remind myself to practice what I teach. and your body will thank you for it.......and it's like interest, you'll have a lot more to spend on others! We decided in class today, that there was some sort of weird, planetary, multi-universe, seventh house of the rising sun, energy that has swept it's way across the neighborhood. Wow, that was a mouthful! It just seems with me and almost everyone I have been in contact with, that emotions have been full tilt boogie. Is it that way every where, or is it just the heat and humidity slowly drowning all humans in the south???? The past few days, I have felt every emotion possible, I know Rick keeps waiting for my head to spin and green goo to shoot from my mouth. (that was not a pretty image) I remind myself that when times are strange and difficult, my mode of transportation should be a leap of faith. I have done a great deal of leaping this past week. But I am human, and I want them NOW!!!!!!! I know that there is a lesson to be learned in the midst of this emotional hurricane, but sometimes I just want to be the old dog that can't be taught any new tricks! and then I remember to practice what I teach.......and breathe......and leap some more. This was on a birthday card that my niece Dannielle and her husband David gave me years ago.......I found it in my desk drawer tonight, and the message was just what I needed. Life takes unexpected turns, maybe just a really sharp curve and you're back on track, or maybe a fork in the road, but you have no choice in which fork to take. There are bumps, hills and mountains in life......the bumps are expected, hills...... well you hope you have the strength to climb them, and the mountains..... that is when you hope with prayer. I think I have a happy heart, I know that it lifts to the music, and I have soared and I swear at times I have floated! Even in times of great grief and sadness, there has been happiness somewhere in my heart, it might have been subdued for awhile, but it never left. The happy heart, isn't that such a wonderful phrase! For me, the secret to a happy heart is staying in the moment........actually, I think that is probably true for all of us. Today has been one of those days, that if I had let myself drift into the future or past, there would not have been much happiness in my heart.....but I kept taking those meditative breaths that I keep talking about......stayed in the present moment.....and tonight I have a happy heart. When I found this old birthday card tonight, it was a gift, a reminder if you will of all things important in my life. I am tacking the card on the wall by my desk, so that my happy heart is reminded to stay happy. appears, climb it with a happy heart and hopes and prayer. Tonight, may we all have a happy heart! I spent some time today looking at my vision board. Usually I make the board on my birthday in March, but this year I did it in January, I guess I wanted to make sure that I stayed focus this year. 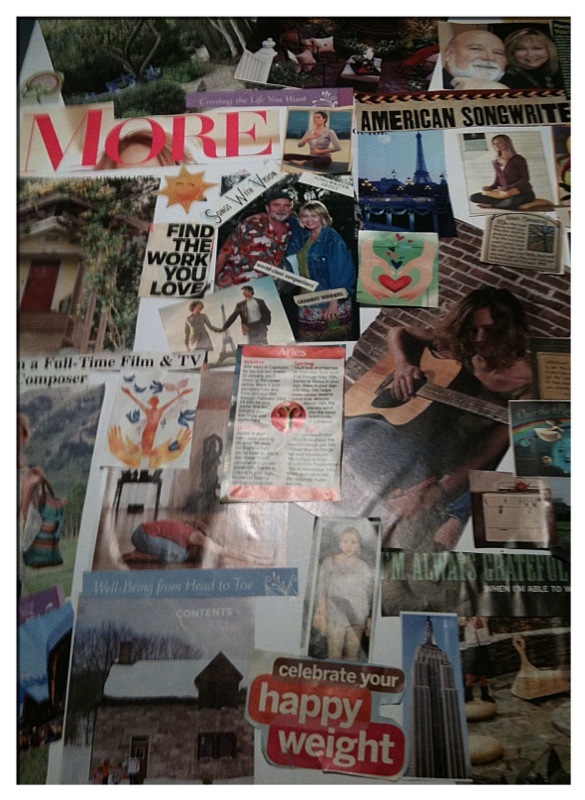 I have used vision boards for several years, they work. It is a way to define and decide what is important in your life, and what you want to achieve. For those of you who did not read my post about vision boards......a vision board is a tool, a board if you will, with photos, words, anything depicting the life that you want to live. and second, we did the arbor to our front door, there are still several "visions" on the board that I am working toward. But it made me feel really good that two had become realities. I try to look at my board daily, it reminds me of dreams, and wishes, and goals. Why does the "vision board" work? Well, it does several things, as you look for photos, art work, words and phrases that represent your visions, it reinforces what you want, it helps you to focus on what you have decided is important in your life. Looking at it daily, reminds you to continue working toward what you deemed important. It causes "conflict" if you will in your brain and gently nudges you to pursue the path you designed on your board. There are still places to go, things to do, my "visions" if you will are far from completion. But, if not this year, I will add them to next year's board(if they are still part of my focus). That's the beauty of doing a new board each year, as you change, as your priorities change, the board becomes a new map. 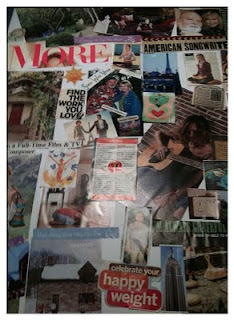 For me, my vision board is so much better than making resolutions. is what keeps me on tract. my visions that become realities. It was announced this week, that the women in our county, Walker, have the lowest life expectancy in the United States.........I kept asking myself how can that be? But there are many reasons, our county is poor, bad nutrition, lack of exercise, uneducated, no insurance, smoking, drug/alcohol abuse. It is just so sad, and in my heart I knew it was bad.......obesity in adults and children, high unemployment rate, it just does not seem right. daily.......the numbers astound me. How many people die in our county under the age of fifty at their residence is quite frightening too....... I know there is also a prescription drug problem. What is the answer? is there an answer? I don't think we matter to the politicians, if you keep us dumb and uneducated, we're easier to control, we believe the fear stories that we are fed by the media. And sadly, religious leaders just tell us to pray.....sometimes you have to put feet on those prayers! I know this is not my average blog, but this is my home, where I live and according to the numbers where I will die before other women in this country. The sad, sick joke with all my female friends......we just need to move! Does anybody out there have an answer? Is there a fix? How can I make a difference? If you have answers I would love to hear them. Thanks for listening. I am naturally curious.......it is just a part of who I am. Rick laughs and says that I get the whole story in sixty seconds, not really but I am easy to amuse. I ask questions, not to pry but just because I am curious. Ever since I was a child, I ask questions......I want to know why, what, where, how. I tend to find almost everything interesting, and I love to learn new things. When we were kids, my younger brother Ricky like to take everything apart,and then fix it.....he is hands on. I asked questions. My parents had us when they were older, I am sure the two of us were a handful. The other siblings were around ten and older when we were born. My questions and Ricky's ability to take things apart drove them all crazy! Ha,Ha! My nephew Jordan asks questions, the funny thing......answering them is quite challenging but I am always up for it. But, he also loves to work with his hands( he is Ricky's grandson) It is wonderful to see our traits in him. My questions have not always made life pleasant, as a teenager I questioned my parents' religious beliefs. My mom could not deal with it, but my dad answered honestly and for that I was grateful. As the years have gone by, my questions have continued, my curiosity has not killed me yet! One of my many jobs that I have had through the years......I did research for a friend who had a PR firm......I loved it! I love figuring out "who done it", and rarely has a movie plot or book ever stumped me. or hostility, but I will be the first to tell you, I am curious, I ask a lot of questions! what I call happy yoga on Fridays or fun yoga. Today we played, in one of the classes we did partner yoga, and in the other class we had fun with sun salutations, there was a lot of laughter in both classes. We have our serious moments, but you know I think that it is so important to laugh and experience joy. Everyone has stress, but in rehab you are on an emotional roller coaster and there many tears shed. I try to do a couple of things with each class......1. Let them know how much they mean to me 2. Encourage them to laugh and smile. 3. Help them to find some sort of peace through stillness and breath work. Some days I come home and I am physically and emotionally empty, some times I cry on the way home. I love teaching, and I love the people I teach. Never have I known anyone who was loved too much. It is hard to explain how this love I feel for them fills my heart and it may seem strange for me to tell them how much I love and appreciate them, to let them know how much they teach me. I look at their faces and I just want them to have the lives they were born to live, to love and be loved, to use their talents and creative energies wisely, to understand that their lives matter. It has been one of those days when I cried driving home, sometimes the love and care they give back to me is overwhelming......often throughout the day, I pray that they be blessed, that they be protected, that someone loves them. Actually I pray that prayer for everyone I know and love, and myself. Tonight I pray blessings for all of you who read this blog, that you too be blessed, protected and loved. My original doc had become a dear friend, and I know in my heart that if our paths had not crossed I would not be here today. Doogie is a good doc, but it has been an interesting budding relationship. First meeting, I was sick, second meeting I was sick, he seemed to be rather perplexed that I was sick the first couple of months that he knew me. He also seemed uncomfortable with me. To be honest, I called my other doc and asked for other recommendations, but he kept assuring me that Doogie was an excellent doc. So, I decided to hang in there. Doogie mentioned to me today, that he thought it would be best if I came to visit when I first feel sick and not wait until I am really sick. I am thinking, "but you need the challenge, you're young, you need me to keep you on your toes." But I agreed that it would be best, we also agreed on regular check-ups, and that I would call if I need him. So, I left the office today with the satisfaction we both learned a little about each other, and that my good health is important to us both, and that we are not strangers any more. He respected my thoughts that I shared about my treatment and he listened. I think I am in good hands. I could not think of anything better than this tonight, I think it has become the sum of my life. something had changed in the past few days, there is a difference in energy.....mine and the energy around me. The fog is lifting, and I can at least see where I am going.....and the rain came today, more like a monsoon. It is still raining and cool! My physical and mental energy is stronger, and this evening I think I am living life again. that day in our area, that many of us have battled our way back to living.....and sadly some have not. folks" for awhile. I laughed and told him things were really bad when someone thought that I was normal. But I understood what he was talking about, that feeling of living life, not just trying to catch it. (unless we have breathed our last breath) there is still time to live......to love, to laugh, to see, to smell, to touch, to hear, to observe. Tonight, I hope we all take the opportunity to live life, not just to run after it, waiting for someday. one is a quote from Dr. Wayne Dyer and the other is the Weather app. I check the weather daily in my favorite places.....Telluride, San Francisco, Seattle, ......you know those places where it is not 100 degrees with 80% humidity. It is 87 degrees here in Empire at 9:48 pm, in San Francisco it is 70......oh to be some place cool! I love San Francisco, we have been many times, and we have played the Napa Valley Folk Festival. I love the climate, the Pacific Ocean, the mountains, the Red Woods, the feel of the city. I can close my eyes, and feel the wind off the Bay, smell the dill and red woods alongside the road driving through the mountains and the little town of Woodside. South of the city, at Half Moon Bay there is a small restaurant that faces the water, they serve tiny Pacific oysters that are incredible. I think I need a San Francisco fix. of sitting at an outdoor concert in Seattle in a misty rain listening to Jim Paige, and eating my way across San Francisco. It's a good night to dream a little dream and look at the I-phone. Splat, do you really know what it sounds like? It is a very descriptive word, but today I actually understood the sound.......splat. Yesterday I drove down to Sumiton to the local produce stand, I spend way too much time there. It's a small family owned business, third generation and they take great pride in their produce. Some days I just wish I had a kitchen there and I would cook all day long! and fresh melons.....a watermelon that must have weighed at least twenty-five pounds. I had bought a watermelon last week and it was so very sweet and juicy, summer time perfection! Last night I placed it on my kitchen table, this morning I decided to move it to the kitchen counter top so I could put a fresh table cloth on the table. Blackie Bear as always when I am anywhere near the kitchen, decided that I needed his assistance. His assistance is lying in the middle of the floor, eating. all over Blackie Bear, seeds, juice, pulp......on the dog, on the floor, on the cabinet doors. Blackie just lay there for a moment looking stunned, then turned his head back to his bowl and continued to eat his kibble. of our tiny kitchen and that big old 100 pound black lab/chow mix. It took me an hour to clean the kitchen and Blackie.....and tonight as I walked barefoot across the kitchen floor, yep......a little bit of stickiness, a reminder of what SPLAT really sounds like! Some nights the words come so easy and then there are nights like tonight......thoughts don't make sense, and words are hidden somewhere deep in the canyons of my mind. It's ok, honestly I never really thought of myself as a writer(well a songwriter but not a writer, writer). Most nights when the words do come, it is so easy......as though they are being fed to me by some loving muse who feels sorry for me.......the person writing the blog who does not see herself as a writer. Many of my friends don't know that I write a blog, many of my family members don't know about this blog, not sure why that is......I do let most of my yoga students know about it. It's not that I even think I have that much to say, most often I just allow my thoughts and feelings to flow through my fingers onto this page. Where do those words come from? and why do I write them? I have an odd responsibility to this blog and to those of you who read it.......sometimes I sit down to write and I am so tired I can barely keep my eyes open, but I want to keep that connection open, that friendship to those who read my words......in some ways it is like a bizarre love affair and there can be no disappointments. Maybe our world has become so disconnected, so fragmented that these blogs feed our need to be heard, to be recognized, to be cared for. Or maybe there are so many of us who feel and think we are invisible and this writing of the blog has given us a voice, and a presence. So there you have it, I start with nothing and the words began to come, though I have to admit they went in a rather strange direction tonight. The moon has been full this week, and its pull, its force plays havoc on us all. But its beauty has, always been breath taking......tonight the shape is starting to wane and as I looked at it earlier I felt sorry for the moon. When he is full, you sense his power but as the nights pass and darkness shadows his light, you realize the light that shines so brightly is only a reflection of the sun, poor moon, no light of his own. Today was the first day since May 27th that the temp was below ninety degrees......I dreamed it rained last night, or rather I dreamed I awoke, heard the rain and thought I must be dreaming.......I wasn't dreaming. We had rain last night and again today......it was wonderful! three inches since yesterday! As the rain fell this morning before I left for work, I sat and looked out the window and smiled, it was so energizing.....all that rain falling on a thirsty earth. Rick and I picked blueberries this evening for waffles in the morning, all the trees and plants seem to shimmer and dazzle in the sunset, drops of rain hanging like tiny diamonds from every leaf. The heat will return with a vengeance I'm sure, but more rain for tomorrow. For now, I am grateful that all around us the rain fell, the day was cool, and Mother Nature showed her mercy. Ok, sometimes I get hung up on quotes and I can't help myself......I have to share! So here is the one that blew me away today. Reading that quote made me think about those who have left their footprints on my heart and how different my life would have been had I never met them. I think about my music teacher in seventh grade who encouraged me to sing, my life changed drastically because of her footprints. She gave me the courage to let music be a major force in my life and for that I will always be grateful. A friend who was a budding photographer often needed a model, he chose me. His beautiful photographs of me gave me the self-confidence to go places and do things I would never have done if I had not met him. His foot-prints on my heart changed my life and gave a shy awkward girl the confidence to spread her wings. they have taught this teacher so much more than I will ever teach them! I am sure that you all have foot prints on your hearts, left by those who maybe didn't even realize the impact they had on your life......and I bet you all have left some foot prints too. and complicated and messy, yet in my heart I know life has to matter, I can't be here just to take up oxygen and space. Occasionally, I allow myself the luxury of a wallow in self-pity, and of course that is when I see all my inadequacies in all their glory.....and then it hits me hard......I have left the present and either fallen face first into the past or allowed unsubstantiated worries of the future to take over my thoughts. Living in the moment, in the present, pretty much assures that you are living the life you should. I think an occasional pity wallow is ok, it just can't last.....for one thing, no one wants to be around me as I wallow! Ha,Ha! A wallow in the slime of self-pity allows for a look in the dark corners of your heart and spirit, usually it is a wake-up call, a note to one's self that life goes on and you are wasting it. pretty uncomfortable.....it's tough when life reminds me I have to practice what I teach. Paths we take are lessons to be learned and usually we can't switch paths midway. If you, like myself struggle with the thoughts of living an inadequate life, don't be so hard on yourself. Everyday can't be a mountain top experience, some days are like the empty spaces between words in a story or the empty spaces between notes in a song, they create the beauty, the sum total of all that is this life. Those spaces are the connecting blocks, without them, we'd never grasp the highs and lows that make life.....life. It will lift your spirits, it will open your eyes, it will remind you that even the little things add up. I wrote my post tonight, I actually thought it was pretty good......but my computer has danced with the gremlins all day and tonight, they won. When I posted nothing appeared and when I looked at what had been saved only about half of my words were there.....so it goes. Now my brain has turned to sawdust, my thoughts have taken leave, and my words are nonsense. Somedays that is the norm, those are the days I tend to want to crouch in child's pose or pull the covers over my head and wait for the gremlins to finish their dance and go someplace else. I sat on the deck tonight and watched the moon rise above the trees, there was complete stillness. The sounds were deafening, crickets, an owl, frogs, critters everywhere seem to begging Mother Nature for relief from the heat. I think the old gal has a sick sense of humor and is someplace cool laughing about the heat. Or maybe this is just her way to get us to slow down......and enjoy the fruits of summer, the coolness of a shade, a drink of cold water, a dip in an icy stream, and appreciation for a gentle breeze. I heard a few claps of thunder yesterday, but no rain......once again I thought it was a mighty cruel joke.......but maybe we will appreciate those drops when they do fall. Supper was simple tonight, panzanella salad and smoked turkey......a perfect meal to enjoy in the heat. I bought cherries and strawberries at the produce stand today. What is it about the juice of fruits running down your chin that feels so good? your skin, and you smell the rain when it comes. I remember as a kid, climbing a tree in the summer and just sitting there in the stillness.......maybe the heat is a gift, a reminder to be still and slow down. Just for you all tonight.......a bouquet of flowers from my garden! It has been a long day, there are several family members who are not well. On my way into work today, I found myself stressed and worried......it was time to practice what I teach. I reminded myself that I could love them, send them healing thoughts and love and prayers, but I could not change what was going on in their lives......I had to let go. So each time I inhaled, I thought the word Let, and each time I exhaled, I thought the word Go...... soon I was softly saying those words over and over. I had to remind myself, that I can't fix everything. it is amazing when you say those two words over and over how things change. 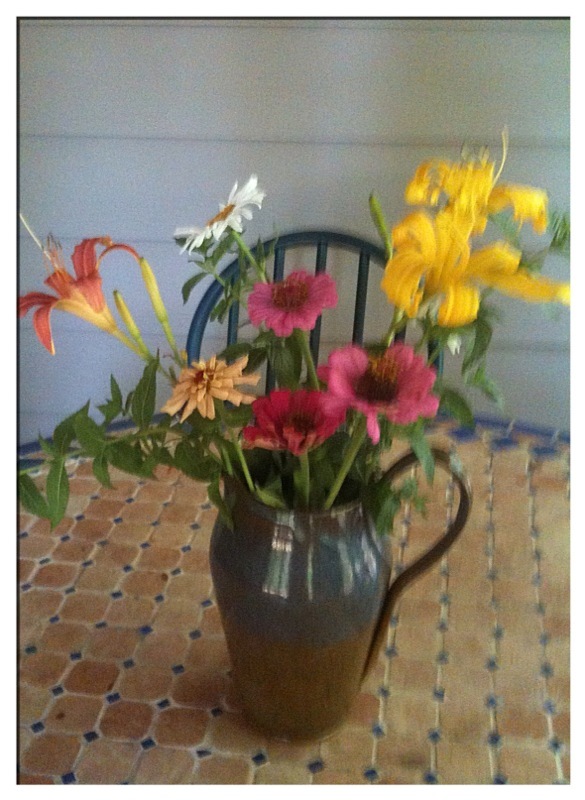 I hope you enjoy the flowers, they are now on my kitchen table.......and yes I am still reminding myself tonight........Let Go. Goodnight, Sweet dreams........and remember.........Let Go. Ok, so here is my purple door.......I know it may seem rather strange to have a purple door, but you know it is quite a welcome home. And, it if is your first time to visit, you have to wonder what goes on behind that purple door! So, the outside of the house is pretty much complete......I am going to repaint the inside, but am taking a break for now and will paint later. What is it about getting your house in order that seems to make the rest of your life become more orderly also? I had started to clean my closet , and had plans to do that this weekend, but since we spent most of the weekend at the hospital with Rick's sister, the closet will get my attention later this week. of Rick some days, with his retirement and all, spending his time doing what he wants. in my life.......of course not, we all do. I think balance is sort of like a meditation practice......there are moments when you find that sweet spot and it's heaven...........but it's only moments. My wish for all of us this week, we grab and hold onto those sweet spots! The door is a brilliant new shade of rich royal purple, will take photo tomorrow. We have spent much of the past twenty-four hours at the hospital with Rick's younger sister. She had emergency surgery, send good thoughts and prayers. Hospitals are so draining, I think it is the energy of fear, and sadness that permeates every square inch of them......it seems no matter how hard you try to remain positive and upbeat it is a battle. Maybe it is all the deaths of bodies and spirits, maybe it is just the way our culture looks at healing and dying. I think gardens and meditation rooms would be really nice, soft music, and lots of windows.......there has got to be a better way of healing. So, I think a dish of ice cream and a good night's sleep will help........you will see the purple door tomorrow. Where is the rain??? ?where is cooler air? ok, whinny moment is now past. Not really. random thoughts become erratic......no a nudist camp is not the answer because no matter how naked you are, it is still hot. And besides, think of the mosquito bites! Now the whine has subsided. I am practicing what I teach......breathing, being in the now. 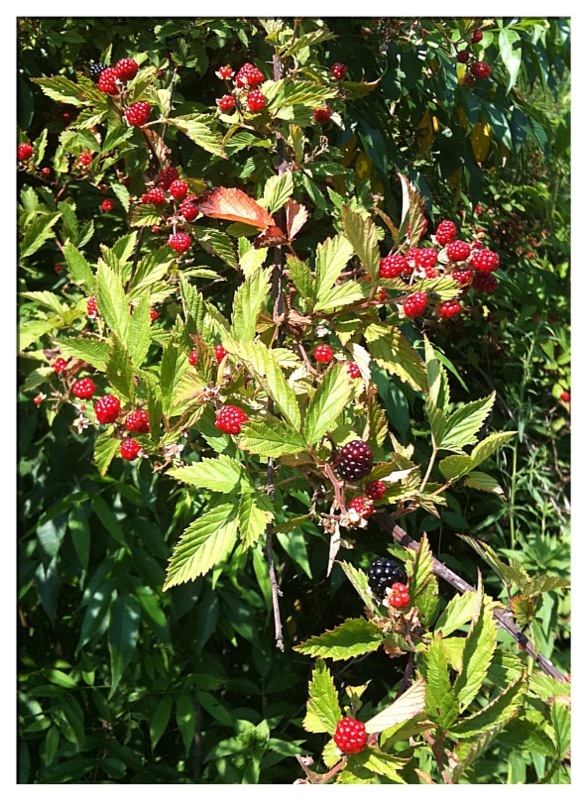 Wild blackberries are every where on the trail down behind the barn.....and they are getting ripe! Jordan and I made a blackberry cobbler this week. Every day that he is here, we walk the trail and he crams ripe blackberries into his mouth. He smells them, and he holds them as if they are precious jewels. I tell myself the summer heat is worth it.......because of the fruits and produce. Watermelons have been extremely juicy and sweet and so have cantaloupe. I am a fruit and veggie kind of gal! It's A Great Day to Be Alive......today, he also helped me wash Ingrid, my car. When his grandparents picked him up, he told the specifics of how to wash and clean a car. Ha,Ha! Tonight is a "berry" short post, but I am tired, spending the day in almost one hundred degree weather, outdoors with a three year old has taken its toll. Good night, Sweet Dreams. There is a song by Teddy Thompson......Separate Ways, it is poignant, heartbreaking and filled with truth. I listened to it going to work today, the melody haunts, and yet at times there is almost joy in the melody, but the lyrics are filled with angst. we forgive too much and never speak our mind"
It's one of those songs that as a songwriter, I wished I had written. There is such great truth just in those two lines. I have listened to my favorite songwriters a lot the past couple of days. We have not played in a couple of weeks, and the itch is almost unbearable. I think I crave the music much like an addict craves the drug, I understand the desire, the need, the willingness.....it truly is not about the money, money has nothing to do with it. It is about letting the song come out, allowing the voice to be heard, and feeling pure unadulterated joy flow through your heart. I love the energy......and it is a two way street.......it is so much fun, for the performer and the audience. If there is perfection in this life for me, then it is out there on the stage, singing and playing. I hope that you all experience that kind of joy, somehow, some way in your lives. baking the perfect loaf of bread, growing the most beautiful rose, it doesn't matter as long as that creative energy has an outlet, an opportunity to blossom and not be hid under a basket, to be shared. So tonight, have guitar will travel. The heat is on......and I miss the mountains. 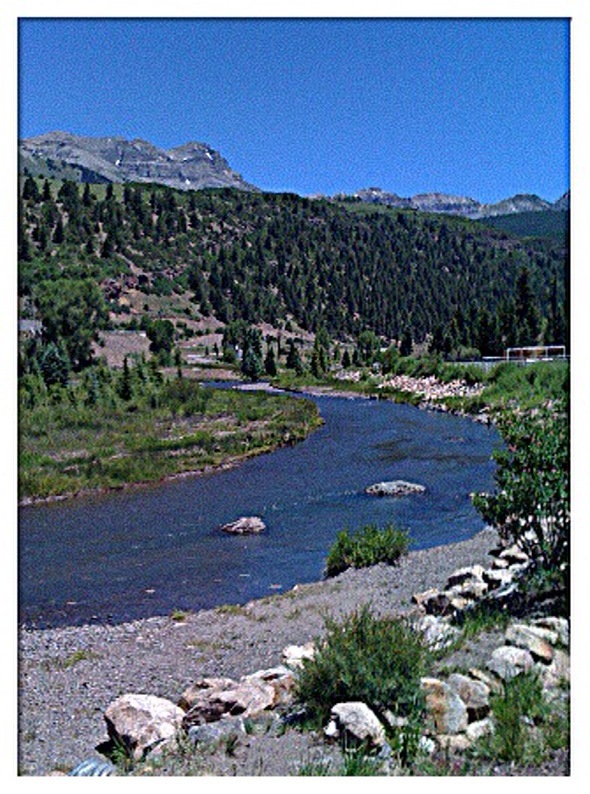 The photo was taken in Telluride, Colorado last July. I love that place, the raw beauty, the pure size of the mountains, and the fact that on the Fourth of July it was around seventy degrees, with a low in the thirties. Isn't that picture just peacefulness? The river was clear and icy cold, and those mountains........I know why John Denver loved that state so much......life is different there. So, today, I looked at my photos from last summer, read my blog entries from that week in July and missed those mountains. Jordan spent the morning with me......he loves berries, black, blue, straw, doesn't matter he loves them. Last week we picked blueberries and blackberries and had them with home made vanilla ice cream, today we picked blackberries and he made his first blackberry pie. For a three year old, he is developing some cooking skills. I had four brothers, they all learned to cook as teenagers, my dad cooked.....in our house, the guys and girls all had to learn what my parents taught as "life skills". Cooking, cleaning, laundry, grocery shopping, changing a flat, checking the oil in the car, gardening, all things that I really am glad I was taught. Jordan is learning "life skills"....... to load the dishwasher, fold laundry, cooking, we make it fun, but I watch his face and I see it all click. He loves to smell food, as we picked berries today, he smelled each one he put in the basket. soon, and I know eventually she will want to move away. I am going to miss him......so I try each time that he visits, each day that he spends, to create some sort of memory in hopes that he won't forget me and the time that we have spent together. Tomorrow, we are working on a mosaic bird bath. One of the people that we helped who lost her home in the tornado loved to garden, so as we cleaned up the debris of what was left from her house, I picked up pieces of broken glass, plates, vases, dinner ware.......I will use them to do the mosaics on a bird bath for her, and later in the week will take it to her. Jordan and I will take photos tomorrow, so you can see our handiwork. the list could go on for days.......we are all so guilty of thinking we can change someone. Think about how freeing, the letting go of wanting to change someone or some situation. as little Miss fixer/care giver that mindset deals with wanting people to change......you know the drill......if I can fix everything, then "they" will be happy, "they" will have a better life, etc. Every once in awhile, I have to shake up my world, and realize that we are who we are. We change only when and if we want to, I can give freely of my love, but it has to be with no attachments. No bargaining chips, none of this well stuff about, well I did this, so you have to do this. There is incredible peace of mind in not wanting to change others. When I truly live it, and walk the walk, talk the talk.......there is peace, and great joy. I think about my mom, she spent her whole life trying to change the people around her, trying to save them and in return, much of her life was in chaos. It took me many years to realize that about her, and many more years to accept that she would never change, she was what she was. When I did, I found peace as her daughter. People are who they are, we are the sum of our life experiences, so if we want someone to change, maybe we need to rethink the relationship.......it might be time to step back, a time-out or move on, or maybe to remind ourselves, the only thing we can change is how we react to the people and events we encounter. The peace of mind is worth it. This is the time of year when Alabama becomes the "hot country". Our friends who live in Tullamore, Ireland, Liz and Tony named our state the hot country. They came here a few years ago, in the summer and felt the heat. We have friends in Michigan who only visit in the spring, fall or winter, same goes for friends in other states.......summers in Alabama are brutal. Right now, it is 10:00pm and it is eighty degrees outside, and it is muggy. The air is thick, moist, and heavy.......but......the gardenias are blooming. and all things summer.......long cotton skirts, tank tops and barefeet, sitting on the porch with bouquets of gardenias, ice tea and a good book. The flowers are not as big as they are sometimes, and the heat tends to wilt them as quickly as they bloom.......but in the early morning, and late at night, that smell permeates the air and the heat becomes bearable. of gardenias, and all is right with the world. I certainly can't top this..........love and hugs to all of you tonight. and honestly, the mayor needed the one on one. Anita is awesome. I know when she became mayor of the little community of Sipsey, Al, she never dreamed she would be in the middle of one of the most horrific natural disasters in state history. She is working 15 hour days, she cries alot, has nightmares, and is trying to figure out how to keep folks from leaving Sipsey. Anita has a big heart. She wants what is best for her community, for the folks who live here. She is already talking with FEMA about storm shelters. She has become my hero. She knows her community is mostly poor, but she has a lot of pride and is doing everything she can to keep Sipsey alive and thriving. the homeless have homes, not until she knows her neighbors are taken care of. She knows them all by name, and she worries about them. I must have hugged her five or six times tonight. keep her in your thoughts and prayers. A brick wall.......I have hit one tonight. My mind is doing the drunk monkey dance(too many thoughts) and the body is tired.......what a combination. Isn't it amazing how empty the brain can become when you are searching for thoughts? I should have known the wall was there, driving home from work today......I was too tired to sing, big warning sign right there! I do want to apologize to all my blog buddies, I have not visited your sites in a while.....this weekend I will drop by and visit and try to leave some witty comment, or at least hello. The house is almost done, one more full work day and I think we can do the happy dance. Well, at least for the outside.....there are a couple of small projects inside, but those may have to wait for a couple of months. The arbor looks great, I am now trying to decide on what type of jasmine to plant, so if anyone has suggestions please talk to me! We ate our first ripe tomato yesterday.......heaven! Nothing quite like picking your first ripe tomato, well actually the eating is the best part. So I sit here, tapping keys, and breathing.......sometimes you just have to let it go.